A woman completed her college exams during labour. A woman has completed her exams... while in labour. A US woman has made headlines after completing her college psychology exam last week – while she was in labour. Tommitrise Collins, 21, a psychology student at Middle Georgia State University, had one day to complete the important online exam. And she was so committed to her studies that she didn’t let contractions stand in her way. Image via Facebook @Shanell Brinkley-Chapman. 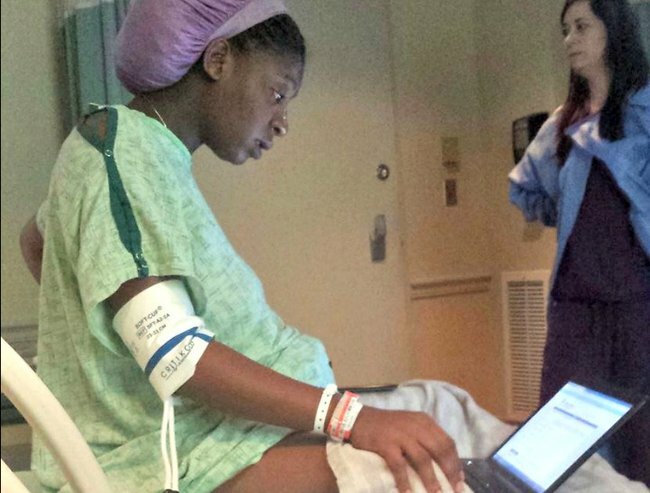 Her sister, Shanell Brinkley-Chapman, uploaded the above photo of the determined mum-to-be completing her test on a laptop in a hospital maternity ward to Facebook. It was accompanied by the caption: "This is what you call "Strong Priorities". Contractions 3 minutes apart and still takes her Psychology Test! You are going to be a great Mom baby sis!" The photo has since been shared more than 15,000 times, and has attracted countless comments of support and admiration. Collins gave birth to a healthy baby girl after a 20-hour labour. She named her new daughter Tyler Elise. Mum and bub are both doing well. Image via Facebook @Shanell Brinkley-Chapman. Collins is set to graduate in December 2016 with a degree in criminal justice. We think any woman who goes through labour is a hero - but this? It&apos;s next level. Congratulations Tommitrise - Tyler is lucky to have a mum like you. Watch The Try Guys simulate labour pain below. Did you do anything unusual during labour?